After succumbing to the devastating effects of heroin and opioid abuse, Breanne, 27, and Jesse, 29, have worked on getting sober together. They have two children together. They are receiving counseling and medication assisted treatment with a drug called buprenorphine. Breanne’s heroin addiction started with a prescription for pain pills and eventually evolved into heroin use. Jesse says he was an alcoholic who started doing drugs with friends. Breanne used heroin during her two most recent pregnancies, which doctors say could result in significant withdrawal symptoms, premature birth, low birth weight, or miscarriage. She said the first baby suffered withdrawal symptoms. He was “real shaky,” said Breanne. She started buprenorphine treatment mid-way through the latter pregnancy. Her most recent child, Serenity Faith, 16 months, was born small, she said, but did not suffer from withdrawal symptoms. The children receive regular check-ups and are doing fine. Maria, 24, used heroin for three years after first abusing pills. She didn’t know she was pregnant until she was four months along. She is currently receiving counseling for her addiction. She is also receiving the medication-assisted treatment, buprenorphine. Her baby, Aubrianna Hope, was born via C-section in mid-January and suffered minimal withdrawal symptoms. She is healthy, and both were released from the hospital after approximately 72 hours. 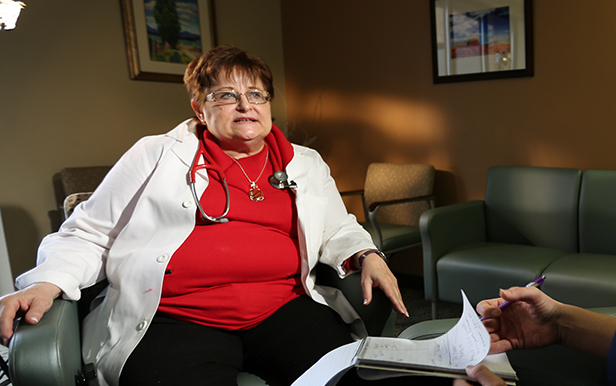 Dr. Barbara Troy is one of the only doctors within fifty miles of Alamosa who has a special license and training to prescribe buprenorphine, one of two recommended treatments for pregnant opioid addicts. Methadone is the other recommended treatment. She quickly observed a drug problem in the San Luis Valley when she arrived in 2014, so she helped the community open its first methadone clinic in 2015. Dr. Troy has many pregnant patients who are being treated with the newer drug, buprenorphine, a sublingual tablet or film. According to a National Institutes of Health study, buprenorphine was found to be more effective than methadone in reducing a newborn’s withdrawal symptoms and the length of stay in the hospital. Henry Ruybal said he watched his granddaughter struggle to gasp for her first breaths when she was born addicted to heroin. He said his daughter, the baby’s mother, used heroin throughout her pregnancy. He said the baby was shaking and seemed to be choking. “It’s heartbreaking,” he said. “I encourage everybody to pay attention to this because it’s not a pretty picture.” The baby, he said, had to be flown from Alamosa to Denver for treatment.